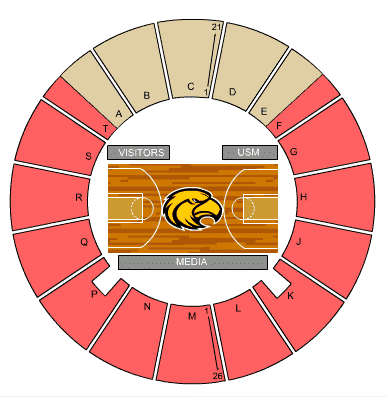 Whether you are planning a visit to University of Southern Mississippi, heading out on the road to watch your Golden Eagles Men’s Basketball play that big away game, or just want to do some sightseeing in the Hattiesburg area, your College Basketball | Southern Mississippi Golden Eagles Tickets | Travel Packages | Sports Trips has everything you need right here! Planning your Southern Miss Golden Eagles Basketball Trip? We hope that you will find using sportstrips.com a great resource for all of your Southern Miss Golden Eagles Men’s basketball Tickets & Travel needs. Early bird rates and discounts apply when booking your event tickets, flights, hotels, and rental cars, so book as early as possible. Book and Build your customized trip today for a remarkable price! See It Live! Are you making restaurant reservations? Would you like to do it the easy way? OpenTable makes it easy to make restaurant reservations the easy way. Beat the crowd and make your reservations in Hattiesburg now. Read reviews, explore menus & photos. Make Hattiesburg restaurant reservations & find the perfect spot for your Southern Miss Golden Eagles Basketball game day, Make your reservations today! From the South (Gulfport/Biloxi): Take US 49 North. Once in Hattiesburg, you will see Roberts Stadium on the left. Turn left onto the service road at the North end of the stadium. Immediately turn right and continue (north) to the light at West 4th St. Turn left at light. Proceed to first light and take a left onto the campus. Sports Trips has up to the minute Southern Miss Golden Eagles Basketball Tickets, Flights, and Hotel Information. Start planning your trip Today!